Well that time of year has come and gone once more, time to unwind from the Christmas and holiday hype, deep breaths. I'm not big on Christmas. Let me correct that, I'm not big on what Christmas has become, as this big "commercial" holiday. Spending time with family and friends is my priority during the holidays, followed by a lot of delicious food (eggnog, anyone?)! Presents are fine and lovely, though thinking back through the years, the vast majority of my favorite gifts have been handmade items. My sister gifted me some amazing pressed flowers in this gorgeous wooden frame with a handmade paper background that she bought at a craft show, and my mom gave me the cutest and comfiest (not to mention warm!) homemade teal leather moccasins and mittens. Gifts that have been made by someone with their hands (even better when you are supporting local businesses!) come with a special quality that you cannot find in a department store or shopping mall. 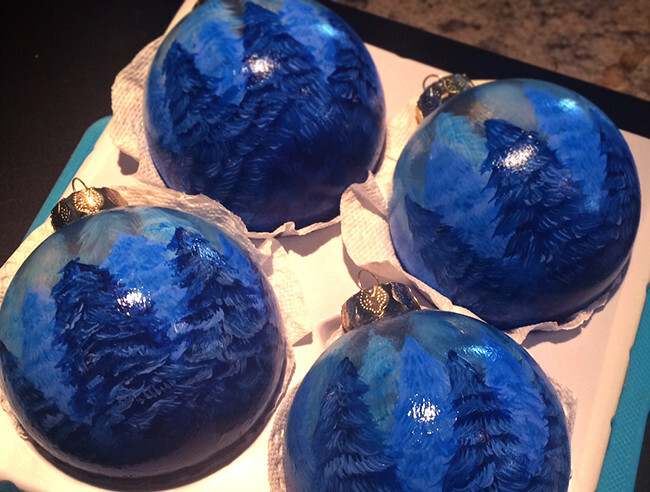 I always try to ensure that I have a good handful of homemade gifts for my loved ones too, such as the two paintings and painted baubles you see below. I know there are a lot of people out there that cherish the sparkle and life of handmade gifts, whether it be made by the giver, or purchased from a creator. What are some of your favorite handmade gifts that you have received? I'm sure I'm not the only one having a hard time dealing with that reality. It always seems that I just get used to writing one year and then they change it on us! However cliché, its always good to reflect on the year past and to make goals for the coming year. 2015 for me was a smidgen underwhelming, with the only real big change being graduation from the University of Manitoba with a Bachelor in Science (specifically a major in Evolution & Biodiversity). This is a very real and very scary change, however my plans are to return back to school come September to achieve a Master's Degree in Biomedical Communications. Looking back on my artwork for the past year though, I am much more content. Sometimes you do not realize how far you have come until you lay all of the pieces out in front of you. I've learned to loosen up and enjoy painting in its purest form. While reflecting is all fine and dandy, its the goal-making for the coming year that excites me. Life has so much to offer, anything can happen (and I'm the type of person that likes a bit of surprise when it comes to my life, its an adventure!). 1. Take some "art" classes that are outside my usual comfort zone. Skillshare is a fantastic online platform for a huge range of creative classes, so I will be sharpening up a bunch of new skills, and hopefully be gaining some new ones! 2. Teach some art classes. I have been working as a Teaching Assistant for university-level classes for the past five years, and have simply fallen in love with teaching adults. Hopefully I can teach some local art classes this year! 3. Find myself in my artwork. Find a happy center, and transform my ideas and soul into the paint on my canvases. 4. Drink more tea. Lots of it. Mmm. Feel free to share some of your reflections and goals! I'm a believer of the phrase "fake it until you make it". If you have a creative skill that you treasure and hope to make something positive from it, try it. Try your hardest, treat yourself like a professional and like it is your calling. By putting your heart into something, people will take notice, and before long you will be on your way to "making it". Love painting or drawing? Create yourself a website, either paid or a free site, and post all of your work. Don't forget to write about your work as well, include details such as the date, medium and size, and your ideas or story behind the piece. Love woodworking, sewing or some other creative skill? Create yourself a little brand, come up with a unique brand name for yourself, even design yourself a personal logo if you feel comfortable. Its honestly a lot of fun creating your own little "business", fills you with pride and inspiration! A gift for someone who has had a large impact on my life over the past few years.